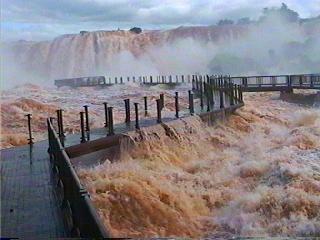 Argentina Discovery - Extreme Adventure in Argentina to discover and experience this multiple territory. Argentina offers a variety of possibilities for adventure activities given its geography: glaciers, volcanoes, deserts, rivers, mountains. From the top of the mountains to the flat plains; from the dense green forests and mountains to deserts and pale white of the salt; from the waters of seas, rivers and lakes to the extreme drought of barreales; citadina from modernity to the lost villages and island environment; Argentina accounts for tourism in all its edges. So, between extreme adventure and serenity spa, a wide intermediate range invites the discovery and experience of this multiple territory. Hence the proposal of alternative tourism appears ... that it is not defined by the risk or the tranquility, which fluctuates between physical activity and the contemplative enjoyment, and that fills the traveler also experiences memories. Thus, the adventure tourism is a controlled personal challenges associated in a natural environment or exotic outdoor setting risk or danger warning. I sleep surrounded by sharks in Bioparque Temaikén. Experience includes dining under the stars and animal activities. The night is spent in the aquarium with sharks and colorful fish. Flying balloon in Luján 60 km from Buenos Aires. Climbing in Sierra de la Ventana, south of Buenos Aires. There crossings night 2 days with overnight in nature. The scenery is very beautiful. And many other activities can be performed outdoors. Canopy on Oath River in Salta. They are 3 km aerial tour of the canyon of the river, at a speed of 30 km / hour. They call it the "Flight of the Condor". Paragliding . One of the meccas for this sport is Córdoba, Tucumán other. Trekking on the Martial Glacier, near Ushuaia. Located at 1050 meters high, access to trails and chairlift takes place after crossing a mountain river, the more adventurous, make walking on ice. Carrovelismo in Rada Tilly, Chubut. 3 km from beach 600 meters wide with constant wind that move the cars to nearly 180 miles per hour. I think it means much ... but so say the experts. Down the Lanin Volcano, 3776 meters high. The crossing is done with guides and takes 2 days. It has a very high difficulty. For experts only. Circuit "Iguazú Forest" in Niagara Falls, consisting of a combination of missionary activities in the jungle trekking, rappel down a waterfall and canopy. Today, there have been 23 visitors (101 hits) on this page!